The past months have been hot, and humid… and it’s rained. It’s rained a lot. I won’t say I dislike rain. (I will say I dislike heat and humidity.) I actually enjoy those nice cool moist days that are drizzling. I do dislike torrential downpours, especially since some of that water usually shows up in my basement. Keep in mind, this isn’t clean water. It’s not just that my basement is wet. This is muddy rain water and everything is filthy. I was sexually harassed on the train one night this week. Not the first time it’s happened, and not the worst time it’s happened – but it happened and I hate it. I’m perhaps more sensitive to these things than some other women – but I KNOW when it’s harassment and not just the usual undesirable bumping/crowding that happens on mass transit. Property tax relief? or just another headache? Winter has definitely arrived in Chicago. 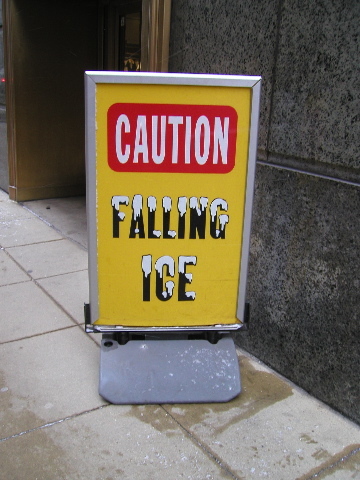 If you couldn’t tell from the vast amount of snow and ice, and the FRIGID temperatures, there are two other obvious indicators: the “Caution! Falling Ice” signs on the sidewalk, and the lawn furniture parked in the street. I take public transportation to and from work every day. I know many of you drive or even walk – where’s the fun in that? I take the el, or elevated train. Well, it’s not always elevated – sometimes it runs underground, which technically makes it a subway, but lots of cities have subways, that’s not very exciting – Chicago has an elevated train, though it’s not always elevated.